Industry professionals who missed SCRS’ new IDEAS Collide forum at SEMA will be able to check out the 10-minute presentations in a new YouTube series. 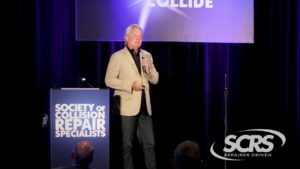 The Society of Collision Repair Specialists on Thursday released its first video from the “TED”-like talks held the Friday of 2018’s SEMA Week: the presentation by M. Scott Ulnick, principal of DuckerFrontier. Ducker is one of the key sources of research into automotive materials trends — an incredibly critical subject for the collision repair industry. Growth in substrates like higher-strength steel and aluminum directly impacts how repairers do their jobs and equip their facilities. “Join Scott as he shares where the industry is today, its evolution and what this means to you,” SCRS wrote in a news release Thursday touting the video. 1:57: Ulnick predicted fully electric vehicles would still remain a relatively small part of the overall North America production run over the next 15 years. 4:50: Ford probably used the level of aluminum it did on the 2015 F-150 because joining steel and aluminum hadn’t been worked out well at the time, Ulnick said. Now, the trend is mixed-materials. 6:14: OEMs are evolving from “Level 1” straight materials substitution for a part (a steel hood for aluminum hood) to a “Level 2” where what had been several parts could be cast as a single item to save weight. “Level 3” involved redesigning the material, such as switching to Gorilla Glass.